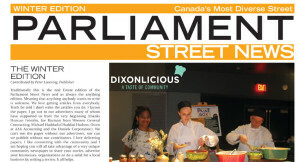 Traditionally this is the real Estate edition of the Parliament Street News and as always the anything edition. Meaning that anything anybody wants to write is welcome. We love getting articles from everybody. Truth be told I don’t write the articles you do. I layout the paper, I go out to our advertisers many of whom have supported us from the very beginning (thanks Duncan Fremlin, Joe Rozman from Weenen General Contracting, Michael Haddad of Haddad Hudson, Owen at AAA Accounting and the Daniels Corporation). We can’t run the paper without our advertisers, nor can we publish without our contributors. I love delivering papers, I like connecting with the community and I am hoping you will all take advantage of a very unique community newspaper to share your stories, advertise your businesses, organizations or do a solid for a local business by writing a review. It all helps. I am not sure why we have never received an obituary or in memoriam. I think it would be a nice addition to the papers and in keeping with our community concept. If somebody close to you, a neighbour has recently passed please send us an article. Please send along any obituary, in memoriam or article of that nature to parliamentstnews@gmail.com. Obits should be 100-150 words plus and image if you have one.